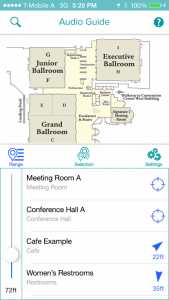 LowViz Guide (Visually impaired navigation app) is the first and only system custom made for installation at conferences and seminars. We are proud to announce that the LowViz Guide iPhone app is now available. This was a cooperation between indoo.rs and MDsupport to help visually impaired people navigate indoor events more easily. The opportunity to work on the LowViz Guide app came about when Dan Roberts contacted us to commission a white label app to help people with macular degeneration, retinal diseases or otherwise visually impaired people navigate new environments. He had previewed our previous work with the San Francisco International Airport and wanted to work with us to offer more for the visually impaired community. and many more, all designed to take the stress out of navigating through often confusing conference venues. The app can be used either visually or through routing-by-voice via the smart phone’s accessibility feature. To make it easier to understand the information, we have created a way to make sure the signals do not overlap. The tech behind is a thing of beauty. Of course we would say that, but it really is. The user opens the app, which is using the indoo.rs magic sauce and interacting with the iBeacons to get from A to B the quickest way possible, it all sounds simple but there is a lot of technology behind the scenes making everything run smoothly. For the opportunity to work on such a worthwhile project, we would like to thank the great team at MDSupport and for delivering what we hope will change many people’s lives for the better, the technical team at indoo.rs and the app developer as well. MD Support recently launched the LowViz Guide at the National ADA Conference in Atlanta. Thanks to the constant encouragement and support from the indoo.rs team, it was a huge success. Five more conventions are already scheduled to receive this exciting technology in the coming months.